Apart from the garden furniture itself, the cushions you place on it also contribute to the overall look. Even more importantly, though, they ensure the highest level of comfort when you are sitting on the furniture. Shaped to fit benches, chairs and recliners, cushions are an integral part of your garden furniture and complement it perfectly. The challenge lies in finding cushions that fit your furniture while also suiting your taste. This is where the wide range offered by Ploß® comes in handy – choose from a broad selection suitable for all products that require cushions. So you can settle down comfortably in your garden and enjoy some quality time in nature. The muted colours of Ploß®’s collection of cushions complete the refined overall impression of your Ploß® garden furniture. 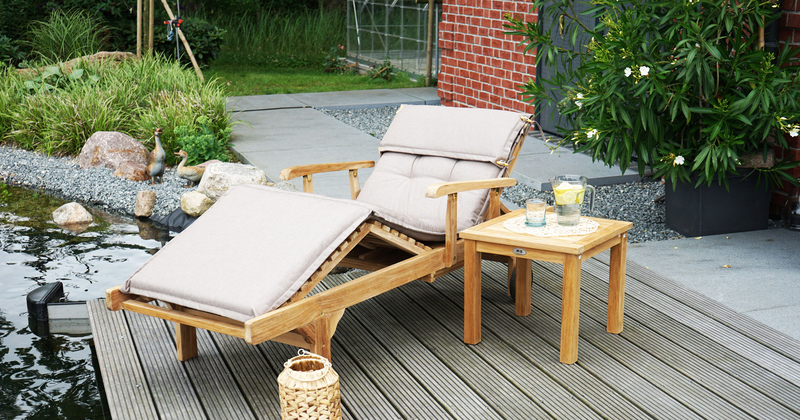 Ploß® has cushions for all kinds of garden furniture. The most common type is used for seats, such as garden chairs and garden benches. However, cushions for garden loungers and deckchairs are also very popular. Apart from the ample padding, you should also keep an eye on the workmanship when buying these. Ploß® cushions for garden furniture are made of fabric, coated with Dralon and Teflon, and manufactured to high quality standards in Europe. This means you get a long-lasting product that will continue to give you pleasure for years to come. It is important that the cushions are exactly the right size for your garden furniture. 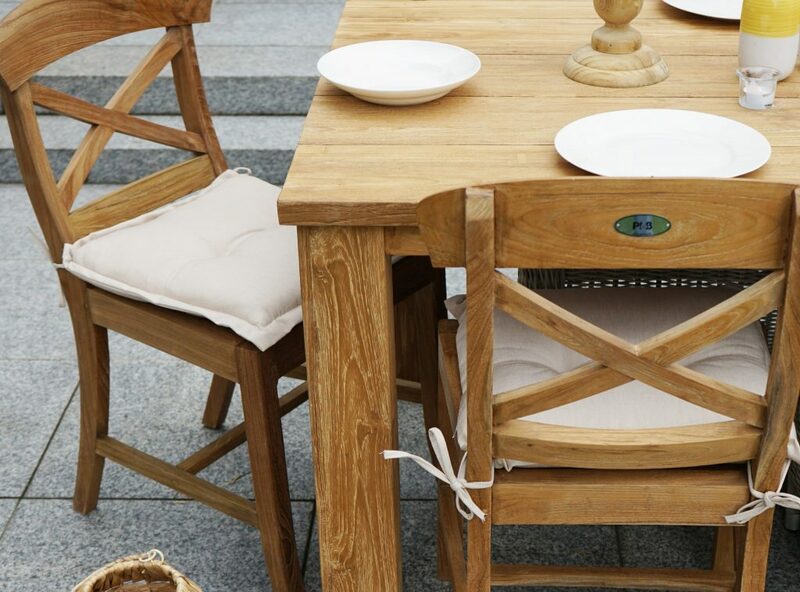 Particularly when you buy them at a later date, you need to know the measurements of your garden furniture. 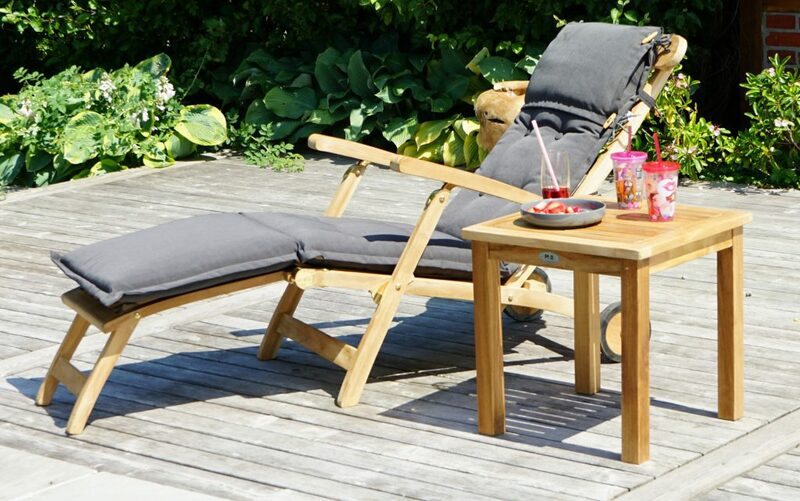 As a matter of principle, you should also look out for means of attaching cushions to garden loungers and deckchairs, as well as to garden chairs and benches. In the case of garden chairs and benches, you can also decide between a cushion that only covers the seat, or one for the backrest too. In all cases, high-quality cushions by Ploß® provide added value in terms of their comfort and upgrade the overall look of your garden dreams. Dirt can easily be removed with a soft brush or a clean rag. 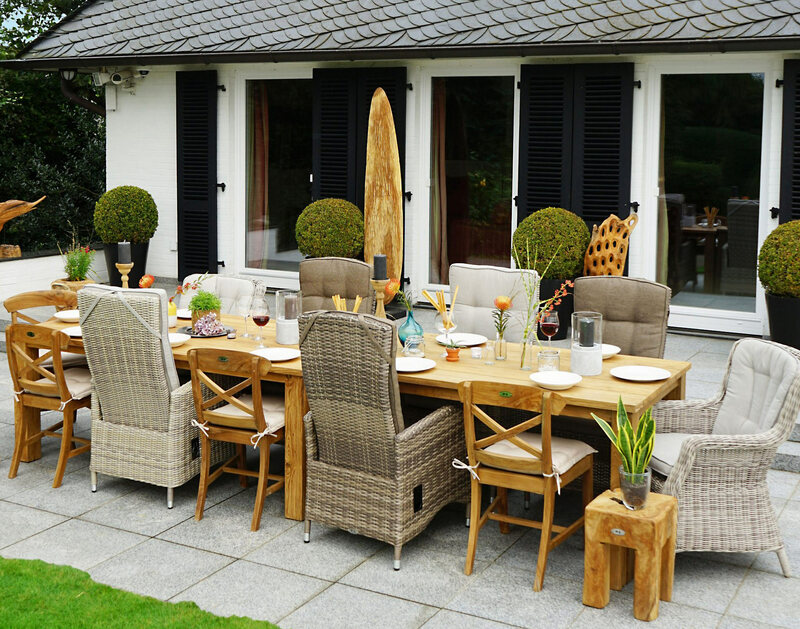 Cushions for garden furniture need to satisfy a large number of requirements. On the one hand they ought to be comfortable; on the other hand they must also withstand heavy wear and severe weather. On top of this, the look of the cushions is crucial in order for them to match the overall look of the suite. Whether or not the cushions need to be waterproof depends on whether they are only placed on the garden furniture when needed, or whether they remain there all the time. 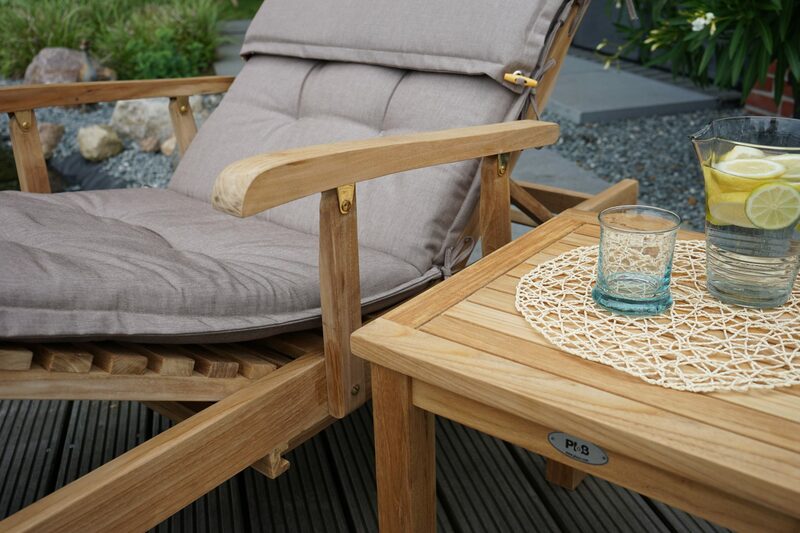 Garden furniture cushions by Ploß® can be wiped down, making them easy to look after, but nevertheless breathable to prevent unnecessary sweating when you sit or lie on them. Cushions by Ploß® are light-fast and weather-proof, and therefore also UV resistant, so as to maintain their colour for as long as possible. These quality standards mean that your new cushions will be a source of pleasure for many years. Ploß® padded cushions are made of 100 % acrylic fibres which are Teflon-coated. The advantage of this material is that it is comfortable while at the same time permitting rapid and simple cleaning. The padding of Ploß® cushions is also thick enough so that you can really nestle down into them. When considering décor, most people do not immediately think of the cushions for their garden furniture. Yet, these are just as important for the look of your garden as the right flowers in the beds. Cushions for your garden furniture should not only be comfortable, but also fit the look of the garden. Different coloured cushions are a good way of designing your garden attractively, but also of redecorating it in the twinkling of an eye, when you want a change. Whether you prefer a classical and elegant look, with warm earthen colours, or a cool grey – the wide selection of cushions from Ploß® is bound to include just the right style for you too. Premium padded cushions by Ploß® always keep their shape thanks to their circular quilting. This means that they cannot be laundered in a washing machine. However, thanks to their Teflon coating any soiling can be removed simply with a damp cloth or by brushing the dirt out gently. The cushions should always be left to dry in the open air and not placed in a tumble dryer. We recommend cleaning the cushions thoroughly before putting them into storage for the winter. When cushions are not being used, the perfect place to store them is a Ploß® cushion storage chest, e.g. from the classy wickerwork ranges ROCKING and RABIDA.